The Black Death, known as the medieval pandemic was most likely the bubonic plague and it is usually associated with the European countries. This association is not surprising, since it is estimated that Black Death killed at least one third of the European population in the 14th century. However, it did not originally start in Europe. Where did black death start? What were the effects on society, religion and mentality? Where did Black Death Start? As an aftermath to the plague, a series of religious, social and economic upheavals were created, which affected the course of European history profoundly. Europe’s population took almost 150 years to recover from the effects of the plague. Until the 19th century the plague recurred in Europe occasionally. How Is Black Death Transmitted? The bacteria that cause the plague are transmitted by fleabite. Fleas that bite humans are of a different species from the fleas that bite rats. The normal host of bubonic plague causing bacteria is the European black rat in which the bacteria can survive for indefinite periods of time. A human contracts bubonic plague when it is occasionally bit by a rat flea carrying the bubonic plague causing bacteria. Once a human being is infected from bubonic plague, the bacteria can then be transmitted to other humans by the bite of human fleas. Once the plague bacteria have multiplied in the human body, there is a small chance of them evolving into a pneumatic strain, which is not only transmitted by flea bite but also by airborne water particles formed from sneezes and coughs. This pneumatic strain of the plague bacteria is actually the lethal one. What Are the Symptoms of Black Death? Bubonic plague initially presents as symptoms of fever, weakness, trembling and profuse sweating. Additional symptoms of coughing, sneezing and parched throat is also present in the pneumatic version. In advanced cases, dark buboes-sensitive black-blue swellings are formed near the groin area and under the armpits. These are actually swollen lymph nodes in which dead blood cells and pus collects. Without treatment the patient dies of this infected blood cell build up in the buboes. The victim can also die from lancing the buboes due to development of toxic shock. How Long did Black Death Last? The pandemic of bubonic plague lasted until the year 1351. However, smaller outbreaks or epidemics occurred off and on for many decades. 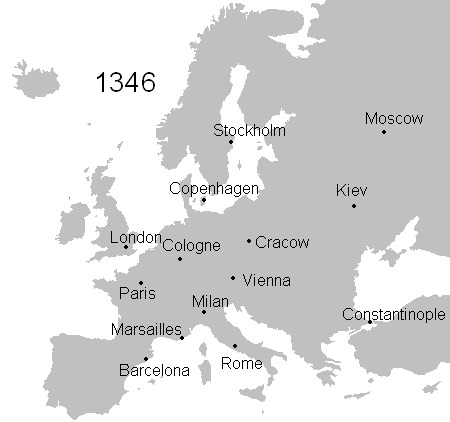 For example, epidemics occurred in Paris and Rouen in the year 1421, 1432, and 1433 and between 1437 and 39. The outbreaks reduced dramatically between the years 1453 and 1504. The last major outbreaks occurred in the late 17th and early 18th centuries. For instance there were outbreaks in the year 1665 and 1722 in London. Small outbreaks took place in the year 1845 in Syria, Egypt, Turkey and Greece. The most recent outbreak took place in Pensacola Florida in the year 1922. The following picture shows the time table and place of black death expansion. What Were the Effects on Society and Economy? There were mixed effects on the society and economy due to Black Death. The demise of feudal system of government was accelerated. The disease was widespread in rural farm workers; hence, there was scarcity of laborers. This led to rise in wages giving rise to a prosperous middle class in the long term. However, Black Death was economically devastating in the short term. The trade was affected leading to a drop of as much as 93%. Due to Black Death, victimization of Jews increased as due to their hygienic practices they were less hit by the plague. This roused suspicion among the Christian communities who accused Jews of causing this devastation. What Were the Effects on Religion? There was long term damage to religious institutions due to Black Death. People believed that God was punishing them for their sins. There was return of strange penitential practices. There was a shortage of quality priests in the churches after the pandemic. The importance of the Cult of the Saints was diminished and a new interest in medicine was aroused. People believed that God did not exist and in Europe the sense of hope and optimism did not return until the late 1500s. What Were the Effects on Psychology and Art? Psychologically a strong and conservative desire for social stability aroused. It also led to a carpe diem attitude in some members of the public. The average age of marriage was raised from sixteen to twenty two. In art, the trauma caused due to plague led to a rise in the common motif of images of dead persons interacting with the humans’ especially in visual art and on tombstones. On the other hand, accompanying the plague, secular literature also increased, with courtly love songs, ribald fabliaux, and other entertainment, which served to distract the public from the anxieties of the plague.